With its unique corner design the Hartwood 7′ x 7′ FSC Cranford Corner Summer House is a summerhouse that gives you plenty of floor space and a generous amount of headroom so that you can design the summerhouse of your dreams and have the perfect place to relax. This is one fantastic looking summerhouse that just oozes style and personality and it is sure to make you the envy of all your friends. The double doors are very well made and as well as offering lots of space to get things in and out, they also have two large windows on them. Two other windows are also on the summerhouse so lots of natural light is going to be able to get inside. 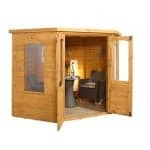 While this is a good looking summerhouse it is also a very well made, long lasting and robust summerhouse. The frame inside is made to keep the whole structure very strong and this is attached to the lovely 12 mm thick tongue and groove shiplap cladding which is watertight. The pent roof and the strong floor are both made with solid sheet boarding which is a type of boarding used by many outdoor structures these days. 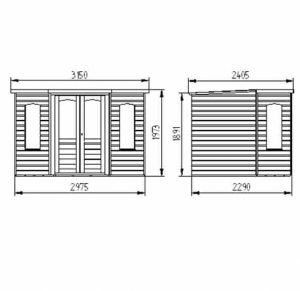 The whole summerhouse has been very cleverly designed and made to last so you are going to be able to have many fun years with this. Sometimes we see a summerhouse and right off the bat we know we have something very cool on our hands, and that is certainly the case with the epic Hartwood 7′ x 7′ FSC Cranford Corner Summer House. 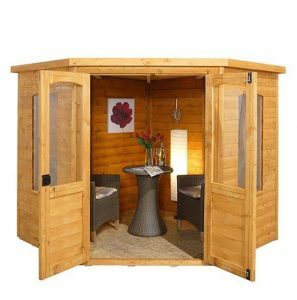 Honestly this is one of the most eye catching summerhouses that we have had the pleasure of looking at and it is sure to be a huge hit. 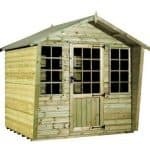 Of course with this being a corner summerhouse it does have a rather unusual kind of shape so giving you the exact dimensions of it is kind of hard to do, but at its largest the width is 10 feet 4 inches and the depth 7 feet 11 inches. Of course this is not a traditional rectangle shape like you would expect, still, you do have a lot of floor space to make use of and the cool shape of the summerhouse means you can lay things out in some pretty inventing and stylish ways. The roof is impressively high as at its highest point it is 6 feet 6 inches and at its lowest it is 6 feet 1 inch, so you will have a nice amount of headroom inside the summerhouse. We really like the pent roof that they have used for this summerhouse. It slopes down towards the back which means the rain will roll off this way. Sand felt has been used which is very strong and this is covering some solid sheet boarding which is a good, reliable and cost effective type of boarding. Using 12 mm thick tongue and groove shiplap cladding was such a smart decision as it really does make this look like a high quality and classy type of summerhouse. We love this cladding as it makes it impossible for rain to get inside the structure, but with its thickness it is also very durable as well. So that you are able to enjoy this for many years, an impressive 35 mm x 28 mm frame has been used. The frame is like the bones of a summerhouse, so this summerhouse has one very strong set of bones that keep the whole structure firm and solid for years. They have made sure that the cladding very securely connects to the framing so they form one very impressive combination. The flooring they have used may not be the best looking, but this solid sheet boarding floor is able to take a lot of weight so you are going to be able to put heavy items in here without the floor buckling under the pressure. One of the things that really helps this floor out is the floor joists which are well spaced out and made with some very strong timber. The Hartwood 7′ x 7′ FSC Cranford Corner Summer House is one very sleek and cool looking summerhouse, so the last thing you want is for a year down the road for rot and decay to start making it look like a building from a post apocalyptic world. Well the way to avoid this is to make sure you treat the timber with wood treatment shortly after construction and then once a year. You do this and rot will never be an issue. 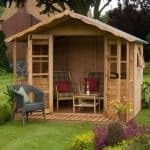 By looking after the summerhouse in the right way and treating it on a regular basis, you will be protected by a ten year anti rot guarantee. The double doors that they have used look fantastic. They are 5 feet 9 inches high and just under 4 feet wide. So getting in a small sofa and a large TV is going to be no trouble at all. The doors go very well with the design of the summerhouse and the strong hinges used will prevent sagging from occurring. Each door has a lovely and good sized window as well as a high quality door handle that is silver coated. As well as the windows on the doors there are another two windows on this summerhouse. All of the windows are made from shatterproof styrene and they all are fixed. We really would have liked to have seen at least one opening window on here, but as it is the windows they have used do look very smart and they will let plenty of light inside the structure. The double doors have an awesome push lock mechanism on them which we really like as it is practical and also a little unusual as well. The type of door handles that they have used would make adding a padlock and a chain very easy as well which is something you may want to do when you are away from home or even to lock the summerhouse up securely over the winter. This is not one of the most private summerhouses we have seen as not only does it have four windows it also has a very attention grabbing appearance so it is the kind of thing people will want to look at. Still if you do not want people to see all the amazing stuff you have in here, then have a think about adding some blinds or even curtains to the windows. While they are not offering any way to customise the summerhouse this does not mean you cannot kick things up a notch. Using a wood treatment that is coloured is one way that you can change the look of the summerhouse. We are sure that no matter if you use a more traditional brown treatment or a more extravagant colour like red, the summerhouse will look fantastic. The only extra that they offer is a plastic shed base, which costs £119.99. 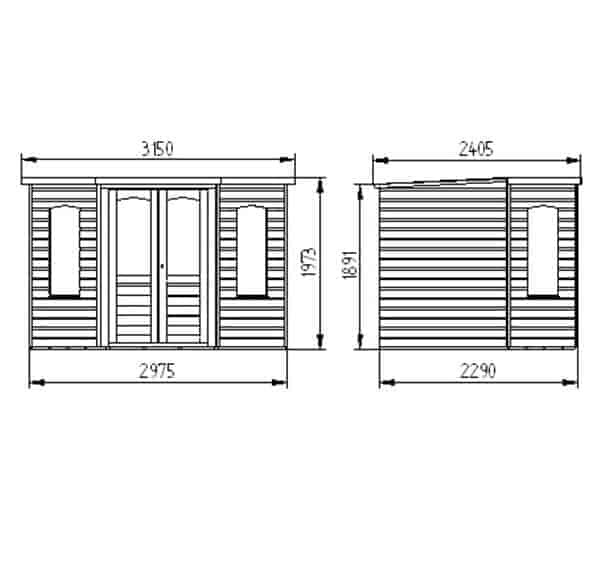 This is for those of you who have to install the summerhouse on a grassy surface that is causing you some concern. We know the price is not exactly cheap, but if you are worried about where you are going to install it then it is worth thinking about. 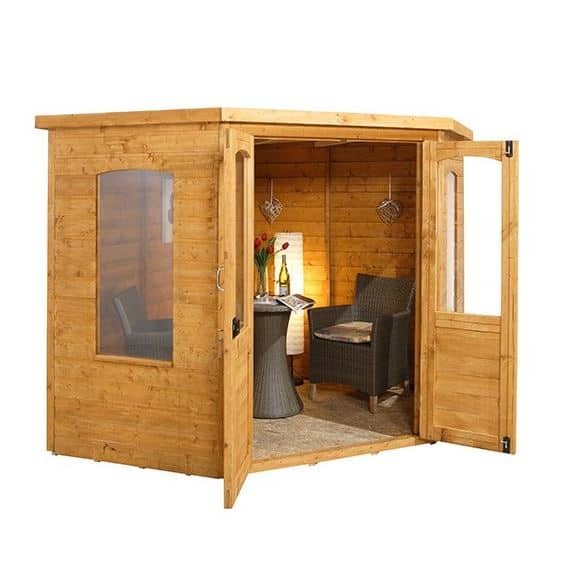 We love how this is not just an attractive looking summerhouse, it is also very well made and high quality throughout. 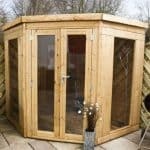 This is a very long lasting summerhouse as they have been very clever with the materials they have used. The wood will need to be treated to keep it free from rot, but you do this and you will find this lasts for 20 plus years. 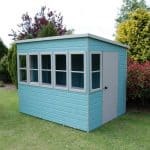 While this is called a 7 x 7 summerhouse, because of its shape it does offer a fair bit more floor space than its name suggests, but of course this does mean it takes up more space than you would think so be sure to measure your garden properly before you order. You will need another person to help out with the installation, so be sure to put on your best smile and have a few biscuits ready so you can talk someone into helping. Around 6-8 hours is what you will be looking at and overall, you should not have too many problems. 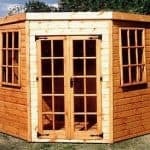 You can clearly see that this is one incredible looking summerhouse and we are pleased with the quality as well, but it is one of the more pricy summerhouse from these guys. However, we do feel that the price they are asking is actually very reasonable considering the high quality. 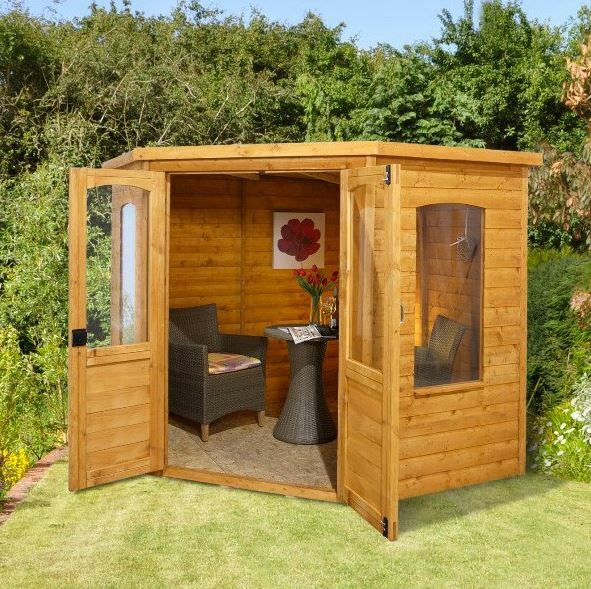 Final Thoughts: Your garden will be the envy of all your neighbours if you have the Hartwood 7' x 7' FSC Cranford Corner Summer House in it, so you can sit back and relax in some serious style. We just love the corner design of this as it makes it so different from a traditional summerhouse. 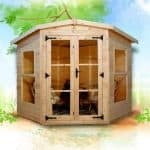 This is one of the more expensive summerhouses in this line, but we do feel that it is worth the extra money because of how well made it is and of course because of its incredible looks. 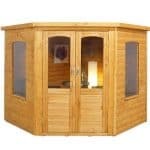 This is ideal for those of you who want a summerhouse that is a good size, has a cool style and will give you many years of use.